Park homes can have some of the highest energy bills as they can be poorly insulated and be heated by expensive fuels such as bottled gas or electricity. The Heat project can now offer grants for residential park home owners to help reduce heating costs. Grants are not available for holiday homes or rented park homes, although we may be able to offer grants for central heating for rental park homes that do not already have a radiator system. Our park home heating grants are available if you receive qualifying income related benefits such as Pension Guarantee Credit, Tax Credits, Universal Credit, Income Support, Income-related Employment and Support Allowance or Income Based Job Seeker’s Allowance. If you are not on one of these benefits, but are on a low income or have a cold related illness, you may still be eligible if we are working in partnership with your local authority. If you wish to discuss our grants or apply to have a free survey please call us free on 0800 0 246 231 or fill in the form on the right. We can then talk you through the best options for your park home. If your park home has a boiler using bulk LPG or bottled gas and it is running inefficiently, has broken down, has a fault or is in any way unsafe, the Heat Project may be able to offer you a grant towards the cost of replacing it. Boiler replacements are subject to survey and will not be completely free, but we can confirm this with a free survey. If you do not currently have a radiator system, we may be able to install a full heating system for you but there is likely to be a cost contribution required. We can confirm this after a survey has been completed. 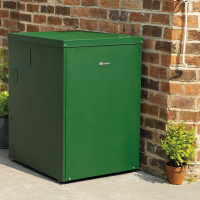 If your park home has a boiler heated by oil, we may be able to offer you a grant towards its replacement cost.